Long, trailing Vee’s of flying ducks and geese are one of the truly enduring images of wild animals. The sight of those wavering V’s crossing the sky means only one of two things: either spring has begun or winter is close at hand. In either case, there is a pressing need for the birds to travel long distances. If each bird flew by themselves, they would have to push their own way through the air in order to move forward. Now, it may not seem like it takes much effort to move your hand through the air as the air offers little resistance. But try doing that for ten or twelve hours non-stop. Eventually, your arm will get so tired from the friction caused by the air you will have to stop. If you’re a bird and you tire soon after starting your migration flight, that means having to land to rest, which is not a good thing when migration is the big priority. The birds have solved the problem of dealing with fatigue when pushing through the air by taking turns flying at the front of the flock. If all the birds are lined up in a row, then only the lead bird has to deal with wind resistance; all the other birds in behind don’t have to flap as hard because they are benefiting from the reduction in wind resistance provided by the lead bird. This means only the lead bird has to make a maximum effort to maintain their speed; the others get to expend less energy to travel at the same speed. Eventually, the lead bird will start to tire, at which point they will drop back and let someone else do the hard work of lead bird while they “rest” in the back of the flock. This is exactly the behaviour you see in bike races; teams of cyclists will alternate the leader on a regular basis so that no one cyclist becomes too tired from ‘breaking the wind’. All of the riders behind the lead cyclist will ‘draft’ behind his lead, maintaining their overall speed while not having to pedal as hard. So then, why do the birds fly in a v-shaped flock as opposed to a straight line, like the cyclists do? Well, it turns out that the act of flapping a wing has a curious effect on the air. The down-stroke of the wing creates little vortices in the air which trail off the wingtip and flow behind the bird. These vortices resemble horizontal, whirling funnels of air. If the second bird in a flock is positioned directly behind the lead bird, the vortices caused by the lead bird will be located just beyond the wingtips of the second bird. However, if the second bird moves over so that the centre-line of their body is directly behind the wingtip of the lead bird, they will run directly into the vortex. This spinning vortex of air will add a little bit of extra lift to the second bird’s body, making it easier for them to stay aloft in the air. 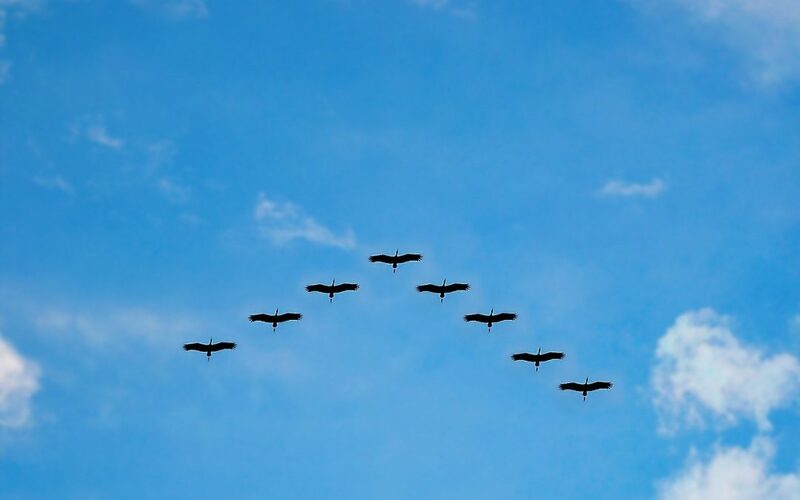 When all of the birds in a flock align themselves behind another bird in this way, the result is an off-set line, which from our position as observers on the ground, looks like a V-shape. Neither the wind blocking effect of drafting nor the lifting effect of the vortices creates a huge difference in energy expenditure for the following bird on each individual wing stroke during flight. But if you’re a goose intent on migrating several hundred miles non-stop, the energy savings that result from flying in a V-formation are enormous. This is the main reason why ducks and geese are able to migrate many miles in a relatively short period of time. And why the birds fly in V’s.